Rocks from northern Labrador contain the oldest known evidence of life on Earth, scientists report. 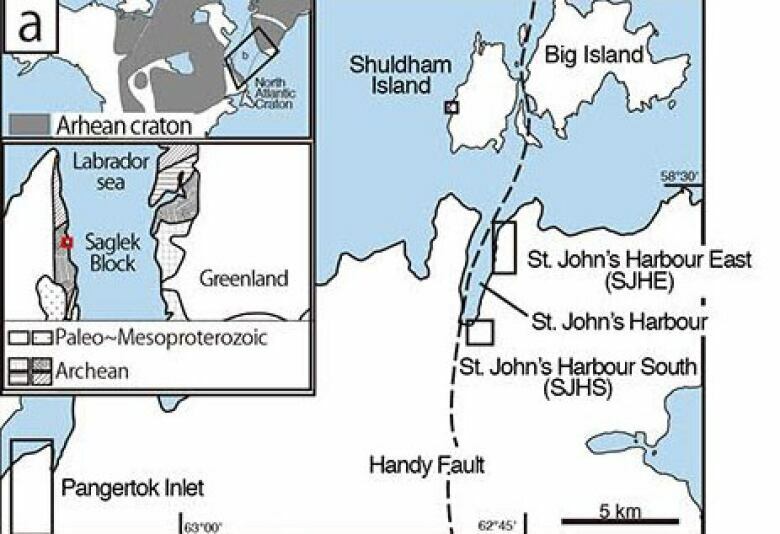 Rocks from northern Labrador have been found to contain the oldest known evidence of life on Earth. 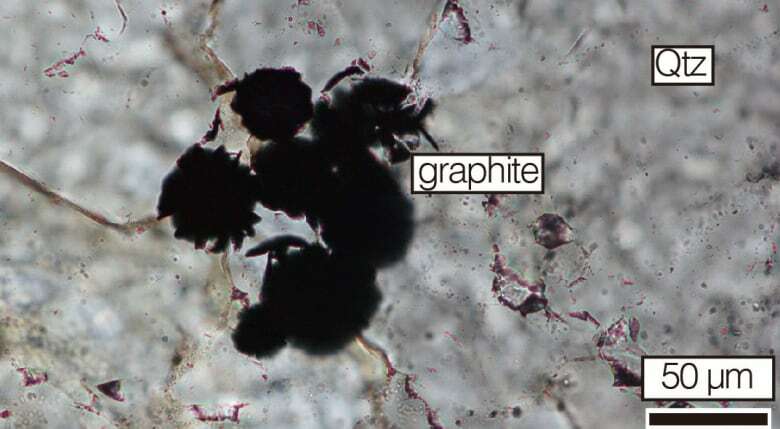 Graphite — a form of pure carbon — found in the 3.95-billion-year-old rocks shows the geochemical signature of having come from the decomposition of living organisms, researchers report in a new study published today in Nature. That's at least 150 million years older than the oldest graphite from living organisms previously found in 3.7 billion to 3.8 billion-year-old rocks in Greenland and northern Quebec. It's also not much more than 500 million years after the Earth formed, about 4.5 billion years ago. Some of the signatures in the Labrador rocks suggests that the organisms that left them were autotrophic — that is, they could produce their own food from chemicals in their environment, as algae and some kinds of bacteria do — report researchers led by Takayuki Tashiro and Tsuyoshi Komiya at the University of Tokyo. The discovery "suggests not only that there may have been life, but there may have been abundant enough life that you could get carbon-rich sediments," said Beth Ann Bell, a geochemist at the University of California Los Angeles who was not involved in the study, but called the findings "pretty cool." It adds to evidence that the Earth at that time had surface water and other conditions to support life, and wasn't as hot and as inhospitable as scientists used to think, said Daniele Pinti, a geochemist at the University of Quebec at Montreal. He was also not involved in the study, but supervised one of the co-authors, Pauline Méjean, during her PhD in Canada. Pinti said that researchers have been increasingly interested in the rocks of the Uivak Gneiss in the Saglek Block of northern Labrador in recent years because they contain some of the oldest rocks on the surface of the Earth. Such old rocks are very rare because the Earth's crust is constantly being recycled back into the planet's interior through a process called plate tectonics. The Labrador rocks are likely a small patch that remains from a very ancient continent, Pinti said: "It's a very special place." Because such rocks are so rare, very little is known about the Earth at that time, although it's known that the interior of the Earth was much hotter than it is now, and there is some evidence of liquid water on the surface. "Were there ponds? Were there oceans? That's uncertain," Bell said. What makes the Labrador rocks particularly special is that they are the oldest known metasedimentary rocks in the world. That is, they were originally formed from sediments deposited by water — the type of environment that decaying organic remains often end up in, said Bell. The "meta" part of the word indicates that the rocks have been "metamorphosed" or transformed by heat and pressure over time: "They've been cooked pretty well," Bell explains. That makes them harder to analyze, but not impossible. Graphite, the dark substance found in pencil "leads," can be formed from chemical reactions of inorganic materials. But it can also be formed when decaying organic matter gets heated up to several hundred degrees. Scientists can tell the difference by looking at the type of carbon found in the graphite. Carbon atoms come in different "isotopes" or forms with different masses — carbon-12, carbon-13 and carbon-14 (which you may have heard of because it's used in radiocarbon dating). Carbon-12 is the most common, and the kind that organisms tend to disproportionately take into their bodies. That means graphite that comes from living things tends to be lighter than graphite from inorganic sources. To figure out whether graphite came from a living or non-living source, researchers use instruments to compare the ratio of carbon-12 to carbon-13. Of course, things get more complicated when the graphite has been exposed to heat and pressure, which can change the carbon ratios. There's also the possibility that the rocks could have become contaminated in the nearly four billion years after they were formed. But the researchers took great pains to test for contamination, account for the exposure to heat and pressure, and extrapolate back the original ratios, Pinti said. "For the moment, it looks very convincing," he added. Bell said she's also "pretty convinced." Pinti said one interesting thing about the carbon signature is that it can indicate not just whether the graphite came from living organisms, but what kind of metabolism those organisms had. The researchers write that the ratio found in one sample "provides the oldest evidence for autotrophs" — organisms that can produce their own food, either through photosynthesis or by using inorganic compounds such as sulphur in their environment. In this case, the organisms appear to use a metabolic pathway similar to modern microbes that turn carbon dioxide into methane and acetate. And they say their work could be relevant to places beyond our own planet that may have harsher environments than today's Earth. "The discovery … will provide insight into early life not only on Earth but also on other planets." Editor's note: The publish date on this story was originally incorrectly stated as Jan. 20, 2014, due to a technical glitch. In fact, it was published on Sept. 27, 2017, after the embargo on the paper was lifted. An earlier version of this story said that there was evidence the organisms could use photosynthesis. In fact, there's evidence the organisms were autotrophs, like organisms that use photosynthesis, but did not use photosynthesis.